Guardians of the Galaxy vol. 2 comes out in theaters this weekend! Need a refresher? Check out Guardians of the Galaxy on DVD or Bluray. Can’t get enough GotG?? See what’s available at your local library! A perfect jumping-on point, featuring the cast of the summer blockbuster–but in Marvel Universe continuity! When the brand-new Zodiac rears its many heads, the Avengers must assemble to combat them. But who is behind the group’s return? None other than Thanos, the mad Titan, who has claimed Earth as his own. Collecting “Avengers Assemble” 1-8. Prepare for Marvel Studios’ newest big-screen blockbuster with these all-new stories taking place just before the film Who is Nebula? What tragic events forged her unbreakable allegiance to her dark lord? And how does Korath the Pursuer fit in? Then, as Gamora begins her quest for the Orb, see firsthand why she is the considered the most dangerous woman in the universe Plus, relive the Guardians’ individual debuts as Gamora and Star-Lord burst onto the scene, Drax and Iron Man take on Thanos, Rocket Raccoon meets the Hulk…and Groot tries to enslave the earth COLLECTING: Marvel’s Gua rdia ns of the Galaxy Prelude 1-2, Marvel’s Guardians of the Galaxy Infinite Comic 1, Iron Man (1968) 55, Strange Tales (1951) 181, Incredible Hulk (1968) 271; material from Tales to Astonish (1959) 13, Marvel Previ ew 4; Handbook profiles. There’s a new rule in the galaxy. No one touches Earth No one But why has Earth suddenly become the most important planet in the galaxy? That’s what the Guardians of the Galaxy are going to find out Join Star-Lord, Gamora, Rocket Raccoon, Groot and the invincible Iron Man as they embark on an explosive and eye-opening adventure. Why has Earth suddenly become the most important planet in the galaxy? The Guardians of the Galaxy plan to find out Star-Lord, Gamora, Drax, Rocket Raccoon, Groot – and the invincible Iron Man – embark on an explosive adventure The secrets they discover will rattle readers for years to come But while Earth deals with a brutal Badoon invasion, the Guardians’ fate has been decided millions of miles away Then, Heaven’s most fearsome angel comes for the Guardians And when Gamora battles the mysterious Angela, the universe hangs in the balance The Guardians find themselves at a crossroads when Thanos’ master plan takes shape. Can Angela’s power help combat INFINITY ? And will Star-Lord betray the entire universe? The cosmic blockbuster hit begins here COLLECTING: Guardians of the Galaxy 0.1, 1-10; Guardians of the Galaxy: Tomorrow ‘s Avengers 1. 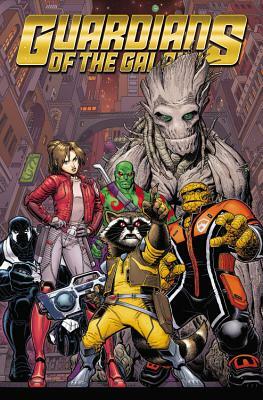 Peter Quill has abandoned the Guardians and his role as Star-Lord to be emperor of the Spartax Now, Rocket has grabbed the reins as team leader – backed up by Drax, Venom, Groot, Kitty Pryde and brand-new Guardian Ben Grimm, the ever-lovin’ blue-eyed Thing But what could put the team into the crosshairs of Emperor Quill and his Imperial Guard? Another old face is back, too – but will it be a welcome return for Gamora, or have circumstances changed in the eight months she has been away? When friends like these cause complications for Rocket and the gang, who needs enemies? They don’t, but they seem to attract them anyway. And the newest threat to the galaxy is a doozy. His name is Yotat the Destroyer – and he will have blood. COLLECTING: GUARDIANS OF THE GALAXY 1-5. Captain America, Doctor Strange, the Thing, the Hulk and other familiar faces join the star-spanning heroes in the greatest war the future ever saw Then, as the Guardians help a planet in turmoil rebuild, threats rise from two other worlds: one of them living, the other gone mad It’s cosmic action as you like it, as the Avengers of tomorrow face their baptism of fire Featuring the introduction of Nikki and the origin of Starhawk Guest-starring the Silver Surfer COLLECTING: Marvel Super Heroes (1967) 18, Marvel Two -In-One (1974) 4-5, Giant -Size Defenders 5, Defenders (1972) 26-29, Marvel Presents 3-12. The arrival of the original X-Men in the present sent shockwaves through the Marvel Universe, but we’ve only seen the effects on Earth – until now When an alien race discovers that Jean Grey, host of the destructive Phoenix Force, is back on Earth, they decide to hold her accountable for the heinous acts of Dark Phoenix Now it’s up to the spacefaring Guardians of the Galaxy to help the all-new X-Men save Jean Grey from twisted intergalactic justice A surprise ally from one character’s past comes to help, but is that enough against the most powerful army in the Universe? You won’t want to miss the first encounter between two of the biggest franchises in the Marvel Universe. COLLECTING: Guardians of the Galaxy 11-13, All -New X-Men 22-24. Rocket Raccoon has been a hero to the weak, a champion of good, a heartthrob to many intergalactic females…but his high-flying life of adventure may be a thing of the past when he’s framed for murder – and the authorities aren’t the only one on his tail (Get it? Tail?) The real killer is an imposter who seems to be one step ahead of Rocket at every turn…now, it’s up to our hero and his best pal Groot to find the truth With Macho Gomez and the Ex-Terminators tracking him, can Rocket make it out alive and clear his name? Superstar creator Skottie Young brings his A-game as writer and artist on the series we’ve been waiting decades for. Because really, this is the only Guardian of the Galaxy you actually care about, right? COLLECTING: Rocket Raccoon 1-6. Exploding from the pages of Guardians of the Galaxy Peter Quill battles the Badoon, fights to save an orphanage, and still finds time to flirt with the X-Men’s Kitty Pryde – all in a day’s work for the legendary Star-Lord But when Peter is captured by a bounty hunter with a strange connection to his past, can the two make amends before he’s fed to a giant alien? Sharing a Badoon jail cell with a criminal and a child isn’t exactly Peter’s idea of a good time…luckily, he’s got an ace named Kitty up his sleeve. But Star-Lord soon encounters the all-powerful Titan responsible for so much mayhem in his life: Thanos It’s the battle to end all battles, but can Star-Lord possibly get out alive? COLLECTING: Legendary Star-Lord 1-5.